We told you earlier today about the theft of beloved Brewers Italian racing sausage, Guido. The whereabouts of Guido and his thieving conspirators—it's got to be at least a two-man job at this point—remain a mystery. Their days may be numbered however thanks to one brave woman's plan: free mustard. Whoever finds the costume will receive a case of mustard a month. A case has 12 bottles. The mustards are all-natural and gluten-free and come in five different flavors: Sweet 'n' Fancy Yellow, Stone Ground Deli, Zesty Horseradish, Sweet 'n' Spicy Honey, and American Dijon. Jennifer Connor is the president of Mustard Girl and is willing to part with all that dijon because she says the races can't go on without Guido. Milwaukee needs Guido. "I'm a super big fan, and I like to give them big squeezes all the time," Connor said. 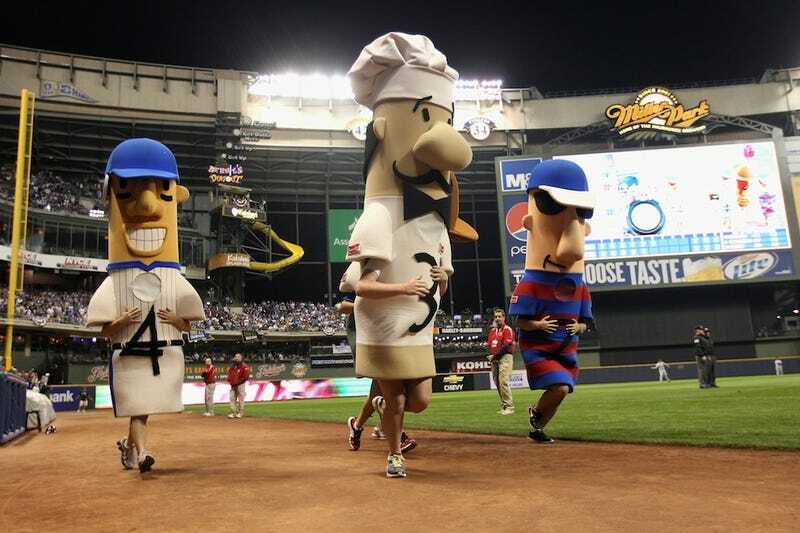 "We have to keep our Sausage Racers whole." Apart from being run by a savvy businesswoman, Mustard Girl is evidently some kind of allegory for the illogical bureaucracy in 21st century America: what better way to enjoy a sausage than with mustard? But in order to get the mustard one must give up the sausage, rendering the mustard useless. Update, 9:25 p.m.: Fox6 News out of Milwaukee is reporting that Guido has been found. They will tell us at 10:00 p.m. Milwaukee time. We will update as warranted. Update 9:40 p.m.: Guido has been saved! According to Steve Chamraz, an investigative reporter for WTMJ-TV in Milwaukee, "two men entered with the abducted Guido, said 'you didn't see this,' dropped him off and ran."